Since, I’m not having wine while on the “17 Days Diet Challenge”. I decided to share a wine review, which has been updated, on one of my favorite wines. Enjoy! Deep ink-like color, spicy, oaky aromas with a hint of tobacco. Flavors of licorice and hint of dark chocolate, creamy on the palate. As my eyes close, taking in the wine… the finish is smooth and long. In case you wondered, there isn’t a difference among Garnache and Grenache; it’s the same varietal. In Spain, the grape is referred to as Garnache. My third sip, DELCIOUS! When I’m sipping wine, the first sip is a surprise and my mind is working to recognize familiar flavors. The second sip, my palate is still working, picking-up flavors that may have been missed on the first sip. The third sip, I’ve made the decision if it’s pleasurable or not. 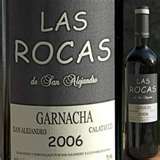 This Las Rocas Garnacha is very much PLEASUREABLE ;). Time for a piece of Ghirardelli 60% cocoa. Red wine and chocolate, the ultimate match! By the way folks, let the chocolate melt naturally in your mouth. If you chew it, the chocolate just goes into your teeth. Mmm… the chocolate enhances the spicy and peppery flavors. However, there’s a slight bitterness on the finish. If you want to gain the benefits of dark chocolate, the chocolate should be at least 70%. If you’re intested in some amazing local and imported chocolates you have to visit “Cocova”, Washington, DC, and they have free sample days visit www.cocova.com. This is a delicious, good, everyday drinking wine and you can find it for under $20 :).